Caution: This statement does not mean that the gravitational forces on the particle from the various elements of the shell magically disappear. Rather, it means that the sum of the force vectors on the particle from all the elements is zero. If the density of Earth were uniform, the gravitational force acting on a particle would be a maximum at Earth’s surface and would decrease as the particle moved outward. If the article were to move inward, perhaps down a deep mine shaft, the gravitational force would change for two reasons. 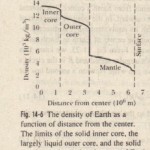 For a uniform Earth, the second influence would prevail and the force on the particle would steadily decrease to zero as the particle approached the center of Earth. However, for the real (nonuniform) Earth, the force on the particle actually increases as the particle begins to descend.